His boss battle would have been easier if the preps allowed us to train in their gym earlier for dat extra punching strength. How's your progress in the game? Did you find Ch. 1 any difficult? Pretty good, unfortunately School has kept me in the way of finishing the game but now that im on holiday im free(until i have to go to work, being a newspaper boy is harder than it looks! ), so far i think im closing up to the final gary fight, i've tried to clear up as much as i can so i think im on 94-96% completion, the only complaint i have is that the enemies, especially the boss fights get so damn easy once you get all the transistors and get full extra punching strength, i hope Gary's fight might be a bit more challenging, otherwise i think ill do a second playthrough where i dont get any of the extra punch strength or the other transistors and see if its any more difficult. Of course there's always the option to get the pc version and mod the game to infinity, but ill need to save up my money (which is hard for a spender like me) Im having serious #FirstWorldProblems here! But,what do you think about the storyline,characters and all that plot related stuff? Enjoying the year? Found a student that you wanna be with because he shares with you the same likes? Storyline is pretty good so far, i mean, the game really grabbed my emotions and sucked it in. When Gary betrayed Jimmy, i got mad, when Jimmy started becoming arrogant and cocky, i wanted Petey to smack some sense into him, i felt so shocked when gary told Edgar that they would take over the school together too, it got me into thinking, how many people would gary have done this to? Just using people to get to the top and stabbing them in the back without a second thought, i felt that all the characters were very well done, i wish Petey was more involved in the story though, i just felt he was a hidden gem just glowing with potential of being a better character. I think i can relate to Petey the most. Although for some reason i felt the most sympathy for Mandy when she was upset about those pictures, i mean, i felt she truly opened up and changed from being that stuck-up girl to an actual caring and sweet girl, most of my other girlfriends i just met them throughout my rough journey, i never felt like i connected to any of the others as i just picked them as i went along (Excluding Zoe, but i don't felt like we connected much either). Mean Girls are people too, ha-ha. But yeah, her opening up made her seem more 'likeable". I did feel a better connection to Zoe, through the missions of tearing up Spencer Warehouse and trapping and dumping Coach Burton in the portable Outhouse. 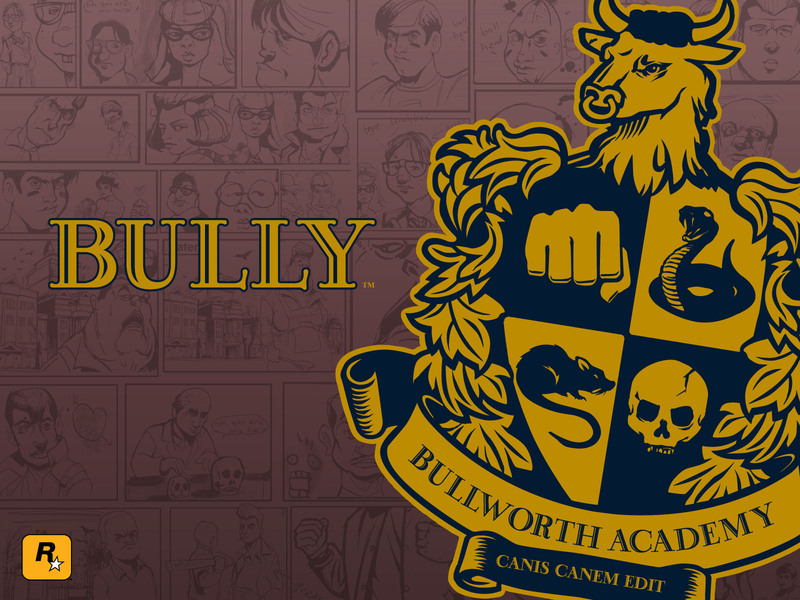 Bully is to easy a game.